Home » Fruits & Vegetables » Health » Healthy Food » Natural Remedies » Recipes » Dates – The Healthiest Fruit On This Planet That Can Cure Many Diseases! Dates contain high levels of fiber, important for good digestion. They are rich with natural sugar, and that’s why they’re great replacement for the ordinary sugar. They are also very nutritive and can satisfy hunger very efficiently. Not only that, date can be used as a natural cure for illnesses like anemia, cholesterol, even cancer. As we mentioned before, dates can be used in treating anemia because of the high amounts of iron they contain. Namely, you can find 11% of the iron needed on a daily basis in only as much as 100g of dates (about 0,90g). Iron is important because it is responsible for the transfer of oxygen in the blood, and the groups that need it the most are children, teenagers and pregnant women. “Eye vitamins” is the name for lutein and zeaxantine, ingredients important for the eye retina and macula, because they protect them from damages and help in improving the eyesight. Dates contain these ingredients so it is important to take in dates if you want to improve your eyesight, especially for elderly people. Dates are rich with calcium, a mineral needed in treating diarrhea. Not only that, they renew the gut flora and increase the level of good bacteria in the intestines. One of their main benefits is the stimulation of good digestion, which means they also help when it comes to constipation. You should just take few dates, put them in a glass of water and leave them overnight, and in the morning drink the juice. This juice is a natural laxative; it is good for the intestines, and helps in eliminating the toxins from your body. The fibers that dates contain (8.5g in 100g of dates) improve your metabolism. A research from the Jordan University for Science and Technology showed that if a woman consumes dates regularly, 4 weeks before the due date, the bleeding and the pain will be reduced. Not only is the delivery easier, but also, as the research showed, women who consumed this fruit coped with the postpartum depression more easily and had more milk than those who didn’t. 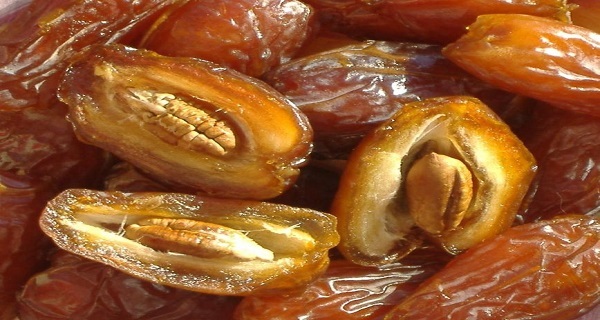 Dates can help in losing weight because of their property to satisfy the hunger. Not only that, when taken in on an empty stomach, they regulate the function of the intestine. As much as they regulate the level of sugar in the blood, one should not eat too much of them, because they are abundant in sugar and that can cause gaining weight. A kilogram of dates contains 3,000 calories. People who have heart issues need to consume dates regularly because they are also good for the heart. For best effect, you should leave some dates in water overnight and blend them in the morning and take this drink during the day. Dates are rich with calcium and magnesium. 5-6 dates contain about 80mg magnesium, a mineral beneficial for the blood vessels. As it is said in a research, 370mg magnesium daily can reduce the blood pressure. Dates contain potassium, thus they help in maintaining the nervous system healthy. There are studies which show that if one takes in enough potassium (about 400mg per day), they lower the risk of stroke for about 40%. Phosphorus, an ingredient which has many positive effects on the brain, is also one of the ingredients one can find in dates. If you need additional energy, you can always have dates, but, if you want to take the maximum energy of this fruit, combine it with milk, and have all the natural sugars: glucose, fructose and sucrose. If you need to increase your libido, or the level of energy in general, take a few dates, put them in goat milk and leave it overnight. Add some honey and cardamom in the morning, mix it all well and drink it. « Enjoying Strawberries? 9 Reasons Why This Fruit Is Great For Your Health!